Posted on October 1, 2012, in Tales2Inspire, Tales2Inspire Contest, TALES2INSPIRE WRTERS CONTEST, Words to Inspire and tagged "authors helping authors project", "authors helping authors", "building an authors platform", "CREATOR OF THE TALES2INSPIRE CONTEST", "inspirational stories", "inspire others with the power of your words", "writers contest'", author, Lois W. Stern. Bookmark the permalink. 2 Comments. 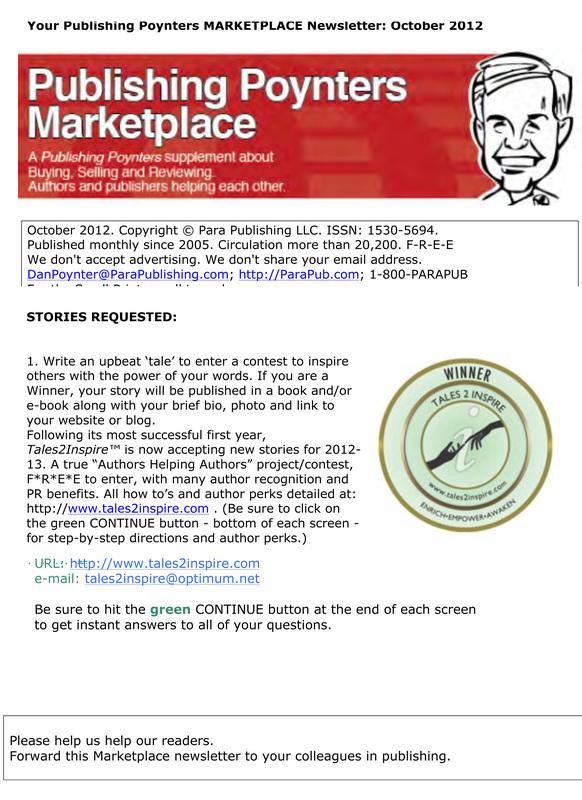 How do you access and sign up for Dan’s inspiring newsletter for writters? I have read the first portion of some really cool stories and tried to copy paste as well as other things….but found no Dan’s news letters. Look under his red logo and you will see a black outline with text inside. Both his e-mail address and tel. # are in that spot. Yes, it is cool so enjoy!